Fresh off the news that former Tenth Doctor David Tennant would be returning to his gripping role as DI Alec Hardy for another season of the sublime series Broadchurch, we can now get our first look at Tennant’s American-style take on the same role. 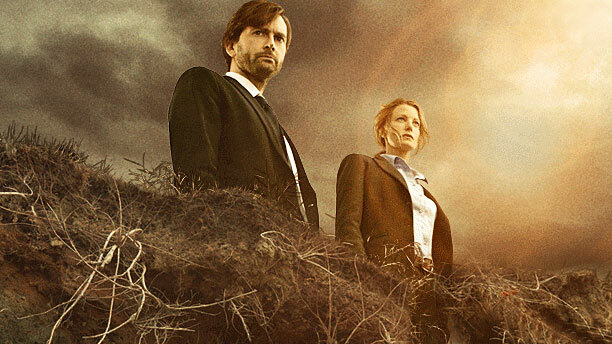 Upcoming Fox series Gracepoint – which is slated to air Thursdays this Fall – is an Americanized remake of Broadchurch, in which Tennant is reprising his role as the lead detective, though he’ll be called Emmett Carver this time around. In the US version, however, his partner will be played by Emmy-winning Breaking Bad actress Anna Gunn, rather than BAFTA-winning Twenty Twelve actress Olivia Colman. However the new show will also center on the mysterious murder of a young child and follow the story of its impact on the small town (the titular Gracepoint) as the detectives attempt to find his killer. According to Kevin O’Reilly, the head of programming for FOX, Gracepoint *will* have a different ending (i.e. a different killer) than Broadchurch, so get your speculation engines started on that now. Anyway, FOX held their Fall Upfront presentation this week – an annual tradition in which the network announces their schedule for the following TV season and attempts to sell ad execs on their new programming – and, as part of the festivities, has released the first official trailer for Gracepoint. You can watch it for yourself below. Warning: Tennant’s American accent is going to take some getting used to! Weirdly, a lot of this seems like a shot-for-shot remake of Broadchurch thus far, so let’s hope that this trailer is just reflective of the pilot and future episodes will get their own distinct look and feel. Because as much as I love these actors, well, I already watched the original, you know? What do you think about Broadchurch? Will you tune in this Fall? Watch the first teaser trailer for Amazon's 2019 adaptation of Neil Gamain's "Good Omens". David Tennant and Billie Piper are reuniting to record new "Doctor Who" audio dramas for Big Finish! Get your first look at David Tennant and Jennifer Garner in HBO limited comedy series "Camping".